Obviously, you’ll need all the usuals: clothes, toiletries, and a credit card with no limit. 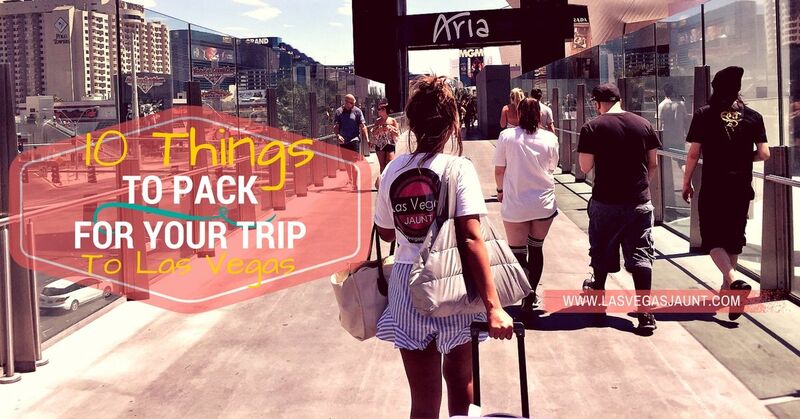 This trip is special, and if this is your first trip to Sin City, there are a few essentials you might not realize you need. Looking at a map of the Las Vegas Strip, it looks like all the resorts and casinos are super close together. In real life, those objects are larger than they appear, and that means you’re probably going to do a lot of walking. One of the best things about Vegas is the glitz, glamour, and style, so it’s tempting to plan your outfits around dress shoes and high heels, but be warned – your feet will end up blistered and sore unless you plan accordingly. Go ahead. Pack the stilettos and the Italian leather. Just be practical about it. Fun fact: much of Las Vegas is solar powered. That’s because there’s lots of sun. Make sure your sunglasses make it into your suitcase, because if they don’t, you’re probably going to end up buying a pair at gift shop prices. See the solar comments above if you’re not quite convinced. Again, you can buy sunscreen in Las Vegas, but if you’re staying in a hotel, it’s going to be gift shop priced sunscreen. Check your local drug store for travel sized bottles, and get whatever SPF you’ll need. Vegas is full of pools, beach clubs, and promenades where you’re going to catch quite a few rays. Sunny pool parties are tons of fun, but sunburn isn’t. Casinos have been putting USB ports at their machines and tables so that players can charge their devices during play, and that’s kind of cool. They also have charging stations where you can pay to charge your phone with their cords. Odds are, you’re going to spend a lot of time out on the strip, walking around downtown, gaming, eating, and generally Vegasing, and that means you’re going to be away from your room and your wall charger. You’re also going to run down your phone battery taking pictures and bragging – ahem, sharing – with your friends back home. A simple USB cord in your pocket is a good idea. Contrary to popular belief, Las Vegas does get cold sometimes, especially at night. During the summer, you’re probably going to have the opposite problem, but up until about May or June, cold evenings are still likely. A light jacket or zip-up hoodie that you can tie around your waist or stuff in a bag will help protect you from the wind and occasional cold snap. Check the forecast before you pack, and plan accordingly. Your first time in Las Vegas, you’re likely to feel like the moisture is being sucked right out of your skin. Plus, you’re going to sweat doing all that walking, especially with the aforementioned abundance of sunlight and oven-hot summers. Bottled water is certainly available – for a price. Save yourself some money and some dehydration headaches with a refillable water bottle, and make sure you keep it topped off whenever you get the chance. There’s nothing quite so beautiful as Las Vegas at night. And there’s nothing quite so disappointing as low-quality cell phone pictures of Las Vegas at night. Some phones have great cameras, but if you’re looking for some good souvenir photos, it’s best to pack a camera. Then again, you could just enjoy your trip without documenting everything on social media. Maybe. You’re going to want some way to comfortably carry that camera, water bottle, jacket, charger, sunscreen, and all your Vegas souvenirs. Lugging around bags of stuff is kind of a pain when you’re walking from casino to casino, watching street performers, gaming, and shopping, so keep your hands free with a bag that has a comfortable crossbody strap. You can totally pull of the man satchel look. Using a crossbody bag instead of a backpack will get you less grief in casinos (some places have restrictions about carrying bags) and they’re easier to get into on the go – you don’t have to take it off to get inside. They’re also a little safer since you can keep it in front of you, within your range of attention at all times. Your sleep survival kit consists of two items: earplugs and a sleep mask. Some hotels will provide these on request, but it’s not always a complimentary option. Plus, there are much nicer earplugs out there that are comfortable, effective, and can be made to fit your ears. For Vegas purposes, those are best. It’s always a little harder to sleep in a hotel room away from home, and since Vegas is an international hub, you’re probably going to be sharing a hotel corridor with other people who are used to completely different time zones, and who also happen to be having the party of their lives. Las Vegas isn’t the city you come to when you’re looking for peace and quiet. Sleeping late is kind of a Vegas tradition, but the sleep mask and earplugs are an important part of that. Your hangover survival kit is pretty simple, too: an over-the-counter pain reliever that’s NOT acetaminophen (Tylenol) and Alka-Seltzer. If you have any of your own favorite hangover remedies, pack them, too. Hotels, being smart and enterprising companies, keep these things down at the front desk, and sell individual doses at hotel prices. You know you’re going to be drinking, so come prepared. Bonus: Alka-Seltzer is also great when you overindulge at one of the great Las Vegas buffets. What’s in your suitcase? Tell us in the comments!